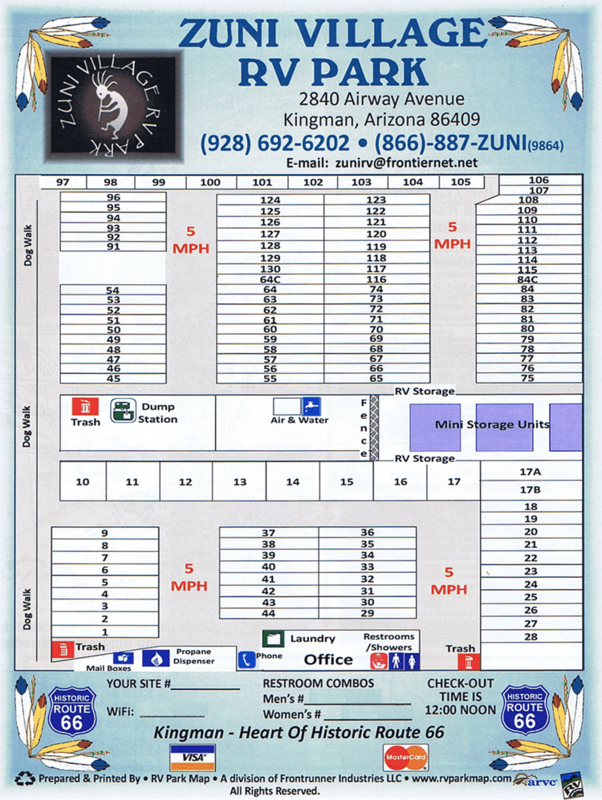 Located in scenic Kingman, AZ, blocks from Route 66, Zuni Village RV Park is the prime spot in the area for an RV campground, featuring one hundred and thirty total level RV sites, including pull-through sites, all of which feature picnic tables and 30/50 amp hookups. Whether you need an overnight, weekly or monthly place to camp, Zuni Village RV Park offers extremely reasonable rates, asking that you even call to compare prices. There is something so enchanting about traveling through the landscapes of the state of Arizona. Perhaps it is because of the curiosity that strikes with the embedded history of Route 66, maybe it is the magic of being so close to the temptations of Las Vegas, or maybe it is because of the strikingly beautiful landscapes that surround the entire area – not to mention the gorgeous nearby location of the Grand Canyon. Such a popular destination is ideal for those traveling in a recreational vehicle, but when it comes to finding the right RV Site it is important to weigh out your options. An RV Campground should be one that includes all of the conveniences of home, if not more. When it comes to traveling through the beautiful southwestern desert, you know that it is ideal to only camp at the best of the best, Zuni Village RV Park. When you are traveling, you want to feel at your most comfortable – you want to be on vacation the entire time! You do not want to spend your precious away time on finding mediocre travel accommodations. Our priority at Zuni Village is assisting in the process of creating the ideal getaway. This is why the management at Zuni Village finds it so important to offer all the conveniences of home, plus some luxuries, including: a pool, a horseshoe pit, picnic tables, dumping facilities, free WiFi, clean restrooms and hot showers, laundry areas, handicap accessible sites, air-conditioner and heater allowed facilities, and propane gas. Honoring KOA, Good Sam, and many other major discounts, it is easy to see why we are the most sought after RV Campground in the area. We are close to I-40 and we are only a 1/4 of a mile away from Route 66. Zuni Village RV Park is centrally located, so it is close to historic Downtown Kingman, including shopping and restaurants. We are a very clean and a very well kept facility because we love being every traveler’s favorite RV Site. Our management is friendly because we want you to feel as though you have neighbors and dependable friends in us. What are your monthly rates? Yearly rates? Are pets allowed? I have a cat. Would I be able to put her cattery up alongside my 5th Wheel?